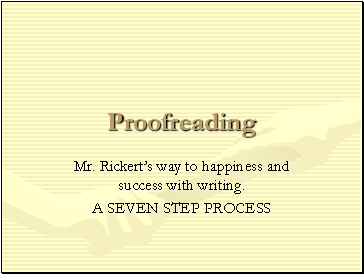 Mr. Rickert’s way to happiness and success with writing. 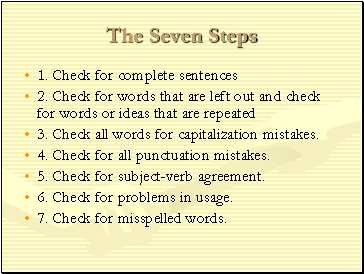 When you have completed all seven steps you will have identified all the possible errors. 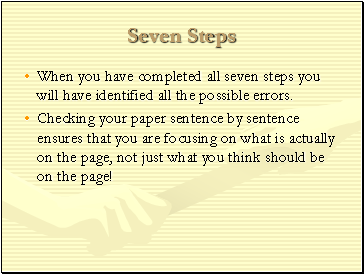 Checking your paper sentence by sentence ensures that you are focusing on what is actually on the page, not just what you think should be on the page! 3. 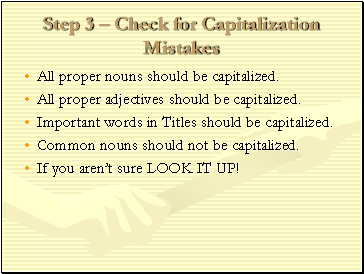 Check all words for capitalization mistakes. 4. 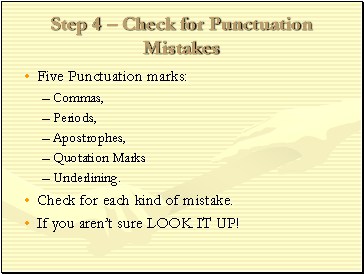 Check for all punctuation mistakes. 5. Check for subject-verb agreement. 6. Check for problems in usage. 7. Check for misspelled words. 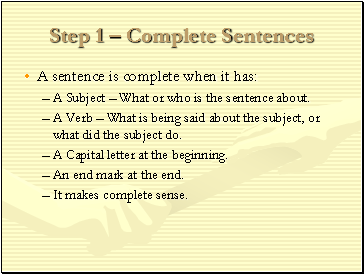 A Subject – What or who is the sentence about. A Verb – What is being said about the subject, or what did the subject do. A Capital letter at the beginning. An end mark at the end. 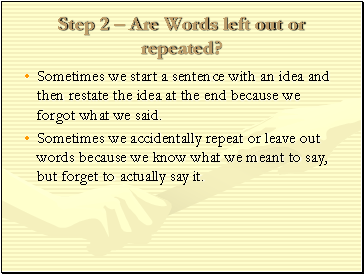 Step 2 – Are Words left out or repeated? Sometimes we start a sentence with an idea and then restate the idea at the end because we forgot what we said. Sometimes we accidentally repeat or leave out words because we know what we meant to say, but forget to actually say it. All proper adjectives should be capitalized. Important words in Titles should be capitalized. Common nouns should not be capitalized. If you aren’t sure LOOK IT UP! Check for each kind of mistake. If you have a singular subject you should have a singular verb. 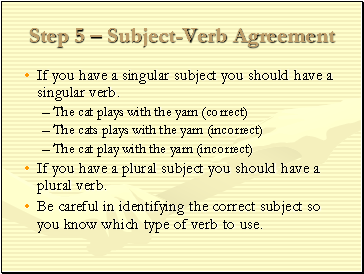 If you have a plural subject you should have a plural verb. Be careful in identifying the correct subject so you know which type of verb to use. Step 6 – Check for problems in usage.